The "Field Tests" (Exploration Points) - frame contains a table with all inputted tests. The name, type, coordinates and state of test are visible in the table. Next to the table, the selected test is displayed. This frame serves to the input the raw data of all field tests, which were carried out on the construction site. 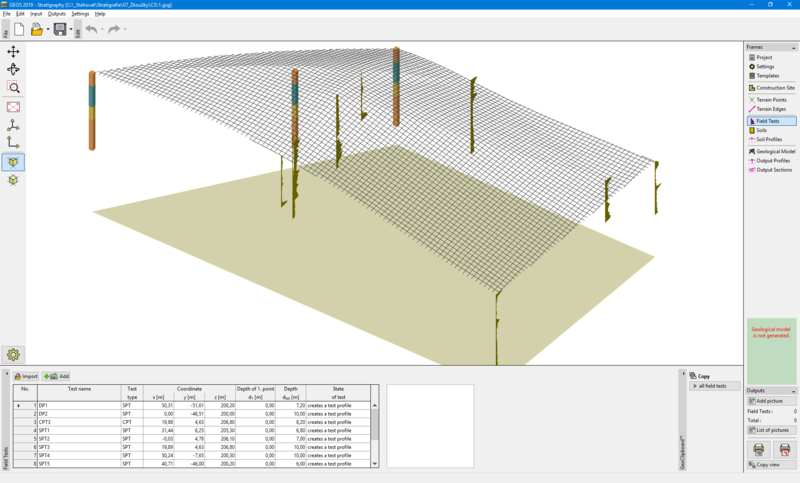 It is possible to enter not only the data required to create a geological model, but also optional data for the creation of geological documentation. The tests should be entered in this frame always as uncorrected in the real state (as carried out on the construction site). The modification or interpretation of tests is performed in the "Soil Profiles" frame. Each test automatically creates a soil profile (if it is not disabled using the "Field test generates a soil profile" button). When a large number of field tests is imported, some tests can be located out of the construction site. In this state, the test does not create a soil profile and is not displayed. The tests can be added using the "Add" button or imported using the "Import" button. Visualization of the drawing on the desktop can be modified in any input regime based on the setting adjusted in the "Drawing Settings" frame and with the help of buttons on the tool bar "Visualization".